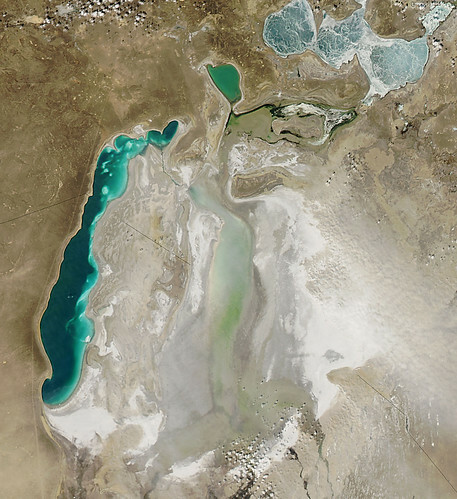 Millions of years ago, northwestern Uzbekistan and southern Kazakhstan were covered by a vast inland sea. When the waters receded, they left uncovered a wide plain of saline soil. One of the remnants of that ancient sea is the Aral Sea, the fourth mass of inland water on the earth. Today the Aral Sea is actually a huge lake divided between Kazakhstan (in the north) and Uzbekistan (in the south). Their water level and area are determined by the flow of two great rivers of Central Asia, the Amu Darya and the Syr Darya, and by the increasing anthropogenic needs. In the past 30 years, the Aral has shrunk to lose 60% of its water, turning what had been prosperous coastal cities into forgotten towns in the middle of the desert. Apart from the loss of water, the increasing salinity has immensely affected its fish population. One of this coastal towns were Moynaq. Once a prosperous tourist destination and a fishing center, now lies in the middle of the desert, more than 100 km away from the sea. Traces of its seafaring past are the rusting ship hulls and a waterfront overlooking a vast desert. There is a rescue plan to recover the north of the Aral Sea. Launched in 2001 by the president of Kazakhstan and the World Bank, in 2005 the Kok-Aral swamp was completed. This swamp should help the Aral to bring water from the Syr Darya. And it seems that is working.